This autumn’s massive achievement award has to go to the phenomenal Ross Edgley. Yes, you may have heard of him as he just completed the Great British Swim, a 5-month odyssey to swim the entire 2,000-mile coastline of Great Britain. Ross swam 12 hours a day using the tidal patterns to help him along, to swim against some of our tides would have made him go backwards! Sleep patterns were broken, as he would swim for 6 hours then sleep for 6 hours, and never the at same time. 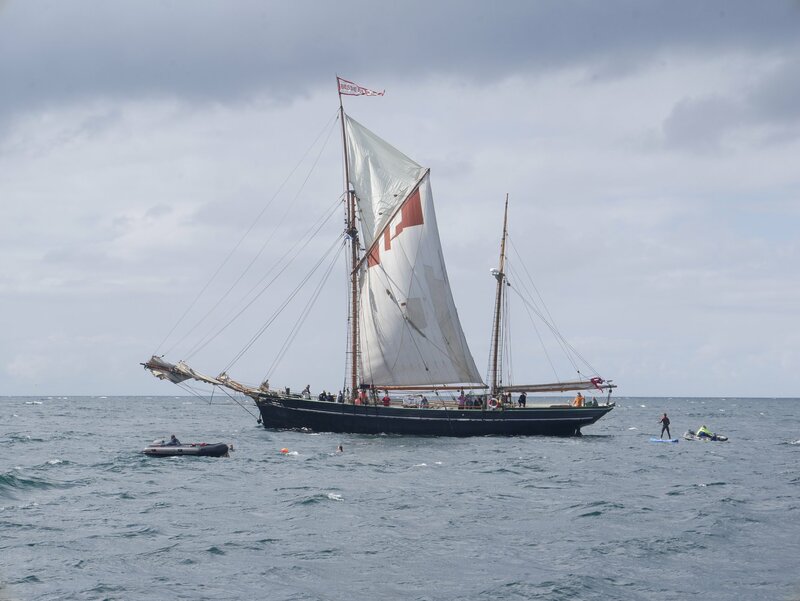 Edgley didn’t step on land for 5 months, but slept aboard Hecate, a James Wharram cat, built by Matt Knight, skipper and swim route planner for the epic. As you can imagine, just being in the water all that time would really affect your body. For food he ate loads of carbs and while swimming he would eat soft foods from piping bags, just snip the end off and pump in custard. He had enormous trouble with salt water, after some months parts of his tongue started to break off and he would find them on his pillow. Salt-water sores and jellyfish stings are all up there in the daily grind of the Great British Swim. Ross and his team finally finished on 4th November after 157 days. Bessie Ellen and her crew were lucky enough to catch up with them in August….. 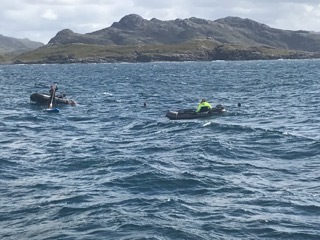 It was the most fabulous day in early August when Bessie Ellen was honoured to take a small part to encourage Ross on his swim and meet up with him after he rounded Ardnamurchan Point. I had been in contact with Matt – the skipper of support boat Hecate – since the team had arrived in Scottish waters, really hoping we could make a rendezvous somewhere. Tight schedules on both boats made it somewhat difficult to arrange but finally, after hearing Matt on the VHF talking to Stornoway coastguard, I knew he was close. After a brief chat with our guests about changing the days plans (we had intended to visit Muck) we set sail from Kentra bay and with all sail set, stormed out into the Sound. Sunshine and clouds with a strong breeze sent the sea spray flying, and far to the South I could make out the shape of Hecate’s hull. I called up Matt on the radio and told him of our plan to sail close under full sail and then come up all standing beside Ross. With a plan in place, I asked for volunteers to swim with Ross to which two of our delightful ladies jumped at the chance. I could see Ross, as the orange swim float was visible for quite some distance, along with the support boats and paddle boards. Altering course we bore down on Ross and once 30 metres from the swimmer, the crew swung round head to wind and dropped the heads’ls and tops’l. Our two swimmers, in just a swimming costume, (no wetsuits for these heroines) were taken out to join Ross. He was over the moon as our swimmers stayed with him for over 10 minutes in real cold, deep water Chatting and laughing with the girls, he stated his appreciation of being joined for a swim, that these moments filled him with energy to continue his mad venture. After their incredible swim, our intrepid girls came back aboard, now totally in love with Ross, to get warm with a well-needed hot chocolate from the galley. Our generous cook sent up two fresh lemon drizzles to give to Team Ross, surely they needed it more than us. As the boats drifted apart, we set sail again and wished them all well, for the next 100 miles were surely going to provide some of the toughest challenges on the whole coast, both mental and physical. So now at the end of his challenge, we are thrilled to have seen him and been touched by his courage and stamina. Congratulations Ross, from Bessie Ellen’s crew.